The Deathkart Looks Like It Is Out Of a MAD MAX Movie! - Muscle Cars Zone! There are many amazing modifications that you can install or upgrade to your car to make it look even more amazing or make it perform better. Even though we have previously come across many such modifications, there is one aspect that is way better i.e. the one that you are going to make something entirely out of scratch. 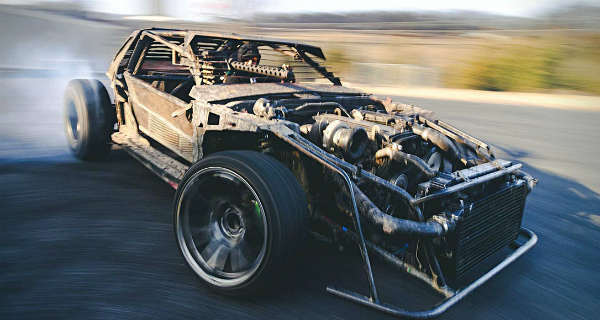 Namely, we are going to take a look at this mighty Deathkart, a Nissan 240SX chassis was the only thing that left on this amazing vehicle. But one thing is for sure, even though it might not look like a powerful and expensive machine, we can surely say, without a doubt, that it surely is. We get the chance to see the Deathkart in action and you are going to want for more and more awesome footage. They push it to the limit and it seems that it can perform all sorts of tricks and stunts. It can drift, drag, climb and gain speed unlike any such vehicle that you have seen so far. Moreover, it looks like it came out straight from a movie, most like Mad Max. There is not further information about how powerful actually is and what do the numbers have to say about it, but we are pretty sure that it is way more than decent. The guys seems like they are having some amazing and fun time outside the shop, and we do too! What do you think about the one and only mighty Deathkart?